The Macquarie Water Pipeline Project includes the construction of a 39km-long water pipeline from the Macquarie River to Suma Park Reservoir in Orange, as well as associated infrastructure. OzArk EHM accepted this project following initial assessment by another consultant. OzArk developed a Cultural Heritage Management Plan (CHMP) based on the results of previous investigation, undertook test excavations and other further investigation. This required further consultation with Registered Aboriginal Parties to refine the CHMP for the construction and operation of the pipeline. The OzArk directed component of the heritage saw 55 person days to undertake test excavation and further investigation at 20 sites and five areas of archaeological sensitivity. The fieldwork program was achieved in one week, in which 62 test pits were excavated and over 3.5km of archaeologically sensitive areas was investigated. 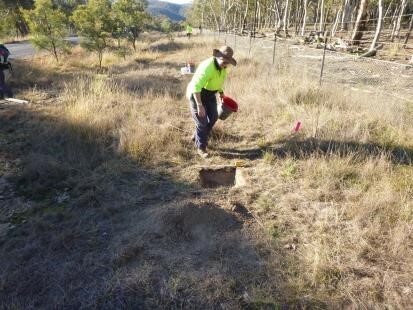 OzArk demonstrated an ability to inherit a project with a complex history and successfully work with the Aboriginal stakeholders, the project team and government regulators. OzArk also managed to execute a fieldwork program with numerous logistical and safety considerations within a tight timeframe.